The beauty beneath our feet on nature’s floor is the source of inspiration for Under Foot. The fibre work evokes a sense of pleasure through drawing attention to the intricacies found in natural debris. The colour, shape and textural qualities of leaves in their dying stages, fallen bark, twigs and other plant materials in this environment are complex, intriguing and beautiful. 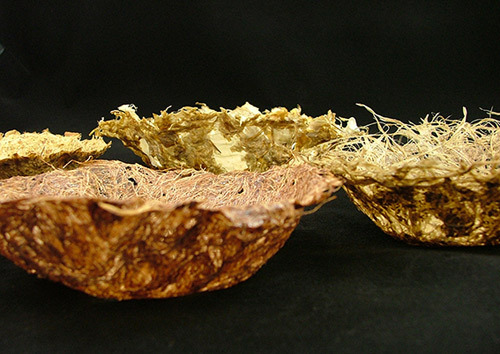 Image: Mary Elizabeth Barron, Containers of nature – Bowls (detail) 2012-2013, plant fibre paper (bamboo, garlic skins, hibiscus bast, philodendron stalks). Courtesy of the artist.